North Carolina General Statute 15-190 identifies the people who may be present at an execution. It provides that prison staff, official witnesses, members of the victim's family and representatives of the convicted felon be present. 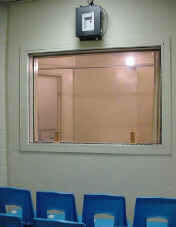 Space limitations in the witness room restrict the number of witnesses to 16. The statute defines the prison staff as the warden or deputy warden, or some person designated by the warden in his place and the surgeon or physician of the penitentiary. The statute also provides for four respectable citizens to serve as official witnesses. The district attorney of the county of conviction and the sheriff of the county of conviction each select two official witnesses. Members of the inmate's family, the inmate's counsel and a minister or clergy member of the inmate's choosing may also be present. At least one week before the execution, the warden will ask the prisoner about these witnesses. Amendments in 1997 gave the crime victim's family the right to witness the execution. The two members of the victim's family will be recommended by the district attorney of the county of conviction. If there is more than one victim in the capital case, the warden will ask the district attorney and/or the sheriff of the county of conviction to recommend two members from each additional victim's family. If a victim's family does not wish to witness, the district attorney may appoint additional witnesses to fill those seats. Five media witnesses are selected to witness the execution and then brief other reporters on what they saw. Media witnesses and alternates are selected by the North Carolina Press Association (NCPA), the Radio/TV News Directors Association of the Carolinas (RTNDAC) and the Associated Press. NCPA and RTNDAC each select two witnesses and two alternates. The Associated Press selects one witness and one alternate. Media witnesses are subject to the approval of the Secretary of the Department of Public Safety. Alternates serve when a media witness is not available. Broadcast reporters who wish to be a media witness should submit a letter detailing their request to RTNDAC representative Bob Costner. Phone: (336) 856-9499 Fax (336) 856-9499.